Uglyworld #370 - Babo Inspects The Garden For Damage (62-365), originally uploaded by www.bazpics.com. Today Babo decided that he was going to spend some time inspecting the garden for anything which may have been broken, damaged or blown away during the high winds we had over the weekend. He declared afterwards that the garden had "withstood quite a battering by mother nature" and that the only sign of damage was one of the metal sculptures which had been blown over a little but still stood semi-upright. 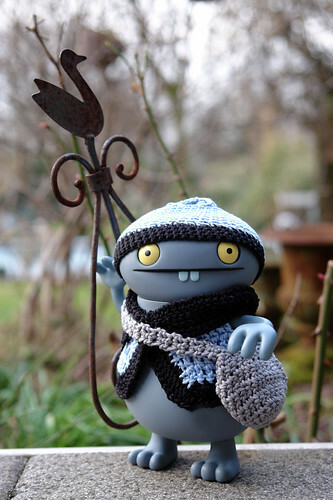 Babo enlisted the help of Wage to get it completely upright again and then said that "the garden is now safe again for little uglies to play in". It turns out he didn't even need Tray's bag which he borrowed incase of finding anything broken or small animals which needed medical attention.